I’d like to say thank you once again to Greg Weeter, who put the NAMS News together for many years. His dedication to our organization and the NAMS News is greatly appreciated. And to our new News ‘editor’, Phil Peterson, thank you for stepping up and taking the reins from Greg; you’ve got big shoes to fill. I know you’ll do well. If you have an article or news item that you feel is worthy to add to the NAMS News, pass it to the National Office who will forward to Phil. The 2019 NAMS National Marine Conference is set for March 24-27, 2019, at the Hilton Hotel in Vancouver, Washington – that’s Washington State. Vancouver is served by multiple air carriers into the Portland International Airport in Portland, Oregon (airport code PDX). Uber standard from the airport to Vancouver ranges from $25 to $30. Taxis are slightly higher and shuttle vans are available. The speakers committee is hard at work lining up topics and speakers. If you have a topic or speaker that you would like to suggest please let the National Office know. There are many opportunities to complete the recertification hours required to maintain your NAMS certification and I encourage you to take advantage of every learning opportunity. I do believe that the best recertification method is to attend the National Conference where you can network with fellow NAMS members and non-members. I look forward to seeing you there. There are still some members who have not yet submitted their recertification hours for this biennium. Please do so soon and plan to attend the 2019 National Conference to get ahead of the requirement for the next. The end of November is usually considered the end of the hurricane season. I, as well as many of you I’m sure, hope it has already had a premature ending. To those of you who endured Florence and Michael, we wish you all the best. Cooler nights are here. On the weather map I see a large blue swath across the Midwest indicating below freezing temps and even snow. Remember, each time you sign a letter, report, or email and include the “NAMS-CMS” moniker, you are representing the professionalism that is NAMSGlobal. We are delighted to be publishing our November 2018 NAMSGlobal E-Newsletter! While we try to keep the newsletter a bi-monthly publication to keep members up to date on current events and educational opportunities, for a number of reasons it was time to upgrade the software used for publication, and the learning curve that goes with it. The effort to get the newsletter out has been 5% writing it, and 95% in the mechanics of publishing it. We are looking forward to reversing those numbers in the future. At the age 64 years, Patrick Irwin died peacefully on Tuesday, July 3, 2018 after a short illness. He was born on May 16, 1954 in Philly and spent most of his life there, graduating from St. Joe's University, then working as a successful marine surveyor for Joseph Irwin Inc, which he owned for several decades. He was a hardworking man, spending a great deal of time at the ports of Philly, Camden and Delaware, where his presence is fondly remembered. He will never be forgotten by those who knew him, including his beloved wife of 17 years, Marcela (nee Barreto), his two sons, Patrick Ian Irwin and Xavier Marcus Irwin, and his many good friends who remember Patrick as "kind, witty and always smiling." He enjoyed the simple things in life, especially watching his boys' hockey and soccer games, horse racing and a good chocolate milkshake. He will be missed by many. This course is designed for the marine professional with experience working with marine systems design, installation or repair. This course will provide the student with a comprehensive and focused look at the key ABYC Standards. The successful certification candidate should have some familiarity with ABYC Standards and Topics Covered listed below. The new three day class format now includes an online learning component designed to provide preliminary coursework prior to the class. The online component for the ABYC Systems Certification class covers chapters one-four of the course book. It also provides an overview of ABYC along with certification requirements and helpful hints to manage your certification. Different types of Bluewater and Brownwater equipment. The exam for this course is optional. http://www.appraisers.org/Education/View-Course?CourseID=110. Consumers wishing to make charitable contributions of property for tax deduction purposes will want to ensure that property appraisals for items worth $5,000 or more are performed by a qualified professional in accordance with USPAP. To learn more about USPAP, The Appraisal Foundation or for help finding an appraiser, visit www.appraisalfoundation.org. What changed? The 2017 edition of the National Electrical Code (NEC) includes new requirements for ground-fault protection in marinas, on docks, etc. This ground-fault protection (GFP), which is typically incorporated into the circuit breakers at the dock pedestals, is not unlike the ground-fault circuit interrupter (GFCI) receptacle with which we are all familiar. While the GFCI is required to trip for fault current conditions of 5 milliamperes or more, the GFP on the dock is required to trip for ground fault current conditions of 30 milliamperes or more. Also, the NEC now requires that the circuit breakers on the electrical feeders serving the docks also have ground-fault protection not exceeding 30 milliamperes. These requirements are found in Article 555 of the 2017 NEC, Section 555.3. Why is this a problem? First, it must be pointed out that this is not the marina operator's fault. They are required to follow the current edition of the NEC when building or upgrading their facilities. Of course, the typical boater believes that the marina is at fault. After all, they have never in the past experienced this problem "in all their years of boating activity." The simple fact is that the new ground-fault protection is exposing electrical deficiencies aboard the affected boats that have remained hidden in the past. These deficiencies include on-board wiring errors, mis-wired or failing on-board equipment, and older on-board technology that is not compatible with the new ground-fault protection requirements. How does this affect the marine surveyor? No professional surveyor wants to certify a boat only to have the buyer discover they have the very problem presented above. Itis recommended that some additional items be added to the survey checklist if not already there. What is being done? A comprehensive list of causes is being developed by the author and should be available soon. A recommended protocol for identification of these issues is also being developed and should be available soon. About the Author: Ed Lethert is a retired electronic technician, designer, consultant and instructor. 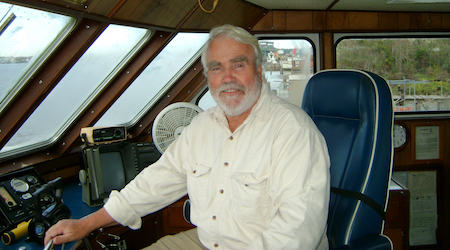 His retirement activities include working with the Electric Shock Drowning Prevention Association to promote ESD awareness, particularly in the marina environment. He is also busy assisting marinas with ESD investigation and mitigation. As of late, he has become involved, along with others, in the endeavors to ensure that the National Electrical Code writers understand the marina and recreational boating environment when adding new requirements to the Code. And he has been helping boaters resolve ground-fault trip issue on the watercraft. Ed lives in Minneapolis, Minnesota and can be reached at [email protected] or 612-670-9801. The opinions, beliefs and viewpoints expressed by the various authors in The NAMSGlobal eNews do not necessarily reflect the opinions, beliefs and viewpoints of the Association, its officers and directors, or the official policies of the Association. The author of each and every article published in this eNews owns his or her own words. The articles reprinted in this eNews may NOT be redistributed in any other media without the express consent of the original source. - Send an email message to [email protected] describing the submission you would like to publish. - Each submission must be confined to one topic and must be less than 300 words in length. - If the editor expresses an interest, email your submission as an attachment in Rich Text Format (.rtf) to [email protected]. - Include your full name, address, telephone number, email address and a short bio in the body of the email.